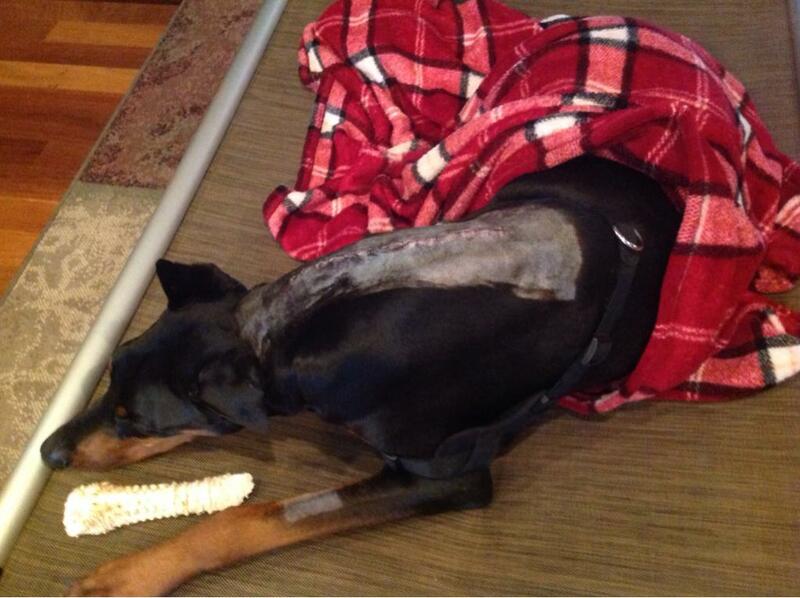 Doberman Forum : Doberman Breed Dog Forums > Doberman Specific Chat > Doberman Health > Wobblers 101...A MUST READ!!! Dogs Name: Zena: waiting at the bridge. Current: Luna the "Lunatic" and Miss Lola the doxie. This is by far the most comprehensive article i've found on wobblers and dobermans. Fully explains the different types of wobblers, and there are many, (disc associated, bone associated, etc) to treatments (medical and surgical) medication, dosages and life expectancy. Includes lots of mri photos. It is a complex disease with many variables, probably why it is the hardest to accept, understand and treat. 33 PAGES of solid information! I really think it would be a good idea to sticky a thread like this in the health section. and if someone/anyone has the time they could search DT's archives and post links here to existing threads on DT that have information about wobblers. Agree! It would be very helpful to have the best information/links on wobblers in one place on DT for easy reference as searching threads and googling it can take days....time better spent with our pups. Hi. Im new to this site & looking for answers....my beloved 2 & half year old Doberman was put to sleep this morning..... after acquiring a limp several days ago she suddenly lost all control of her back legs, then in a day the front ones....she was non responsive & lying flat in a day...was taken immediately to the vets where she had no fever or broken bones as the x ray showed nothing...Luna was then given anti inflammatory injections, still no response...antibiotics & steroids only to be told this morning that she was very ill & struggling for breath...this was when I decided to put her to sleep but cant understand whats happened...can anyone help in this matter....do dogs get this bad on wobblers syndrome as this is what they thought she had?????? lunarbeam, so sorry for the loss of your girl. it sounds like she may have had a couple of issues going on...........wobblers/cvi and possible cardio/DCM too. both health issues are problems our breed has. This is very helpfull indeed, thanks for the link. One more very good link to add. will add more as I come across them. Last edited by Darkevs; 01-25-2014 at 10:16 AM. Wow, thats a lot of threads just on cvi/wobblers, thanks darkev! This is great! just goes to show how many DT members Doberman have had to deal with wobblers. it is a health issue that more owners should be aware of. Yes, not so great that there are so many issues here on dt that relate to wobblers/cvi, but oh so great to have it all in one place for easy reference Certainly one of the most confusing and heart breaking issue to deal with...a healthy, active doberman with mobility issues...knowledge is key in getting the right diagnosis and treatment. Your efforts are very much appreciated!!! Wobbler Syndrome « Canada West Veterinary Specialists ? Quality, Compassion and Caring. Committed to Making the Critical Difference. My 2 yr old doberman slipped on our hardwood floors and took a pretty hard slide into the bar. He took some time getting to his feet but overall seemed fine. Within 4 weeks he was falling, could no longer jump or stand on his back legs and started knuckling on his front legs. X-rays showed nothing, treatment with prednisone for almost 1 month and there was no change for the better. We were recommended to Virginia Tech Vet Hospital for an MRI. It showed compression on his spine at the C5-C7 area of his vertebrae. He had surgery 2 weeks ago and is doing fantastic. I realize surgery is not always the best option but for us it was. Chaos is able to sit, stand and jump- even though he shouldn't be jumping yet due to his recovery. Dr. Pancotto at VA tech, along with the 3 students that were assigned to us, were very understanding and informative about our options and the pros and cons of surgery. Chaos got his staples out on Monday and doesn't have to make the trip back to VA unless his rehab doesn't continue to go well. Wow poor lil guy, that's a big incision. I had a spinal fusion 10 yrs ago that failed but thankfully it doesn't bother me but my scar is tiny compared to your guys... wow. Sending good recovery vibes his way! Wobbler’s is characterized by progressive neurological dysfunction of all four limbs, usually starting with the hind legs. Common symptoms are an abnormal ‘drunken’ or ‘wobbly’ gait, scuffing or dragging of the hind feet, a short, choppy gait of the front legs, neck pain, and holding the head and neck in a flexed (downward) position. Signs may progress to the point where the dog may not be able to walk or get up on its own. 1) Congenital malformation and/or malarticulation of the vertebrae- A misshapen vertebra, or one that doesn’t align properly with its neighbor can press on the spinal cord. 2) Instability of the vertebrae- usually due to malarticulation. This instability often results in hypertrophy (enlargement) of the ligaments associated with the vertebrae, which act to hold the vertebrae in their proper place. Both instability and hypertrophy of the ligaments can put pressure on the spinal cord. 3) Stenosis (narrowing) of the spinal cord canal- Stenosis can be caused by malformation of the vertebrae, or by hypertrophy of the ligaments associated with the vertebrae. This narrowing of the canal will cause compression of the spinal cord. 4) Protrusion of the intervertebral disks (‘slipped disk’)- A disk can protrude from it’s place between the vertebrae and press on the spinal cord due to malarticulation or instability of the vertebrae. It should be noted that Dobermans with no malformation or malarticulation can also have slipped disks- that is not Wobbler’s Syndrome, that is a dog with Intervertebral Disk Disease. As you can see, all of the above causes of spinal cord compression are inter- related; because of this, most dogs have more than one cause of compression- however, there usually is one cause that is responsible for the majority of the pressure on the spinal cord. Treatment of Wobbler’s depends on the severity of the spinal cord compression. Milder cases may respond to rest and corticosteroid (i.e. cortisone) treatment to reduce the inflammation and swelling of the spinal cord. Acupuncture has also been shown to be helpful, especially in relieving pain. Chiropractic adjustment has also been suggested- however, in the case of a dog that has instability of it’s vertebrae, chiropractic adjustment has the potential to cause serious complications. In more severe cases, surgery is the only option. A myelogram or MRI must be done prior to surgery to determine where the compression is, whether there is more than one area of compression, and how severe the compression is. The type of surgery that is performed depends on the cause of the compression. Common surgical procedures performed are a dorsal laminectomy, a ventral slot procedure, a stabilization procedure or a combination of the above. Surgery usually carries a 75% success rate for either stopping the progression of the disease or improving clinical signs if the dog can still walk prior to surgery. The rate falls to 50% in dogs that can no longer walk prior to surgery. The cause of Wobbler’s Syndrome is still unknown. Genetics, conformation of the neck, nutrition, injury- all have been theorized to play a part. Neck x-rays prior to breeding have been suggested, but since the malformation and malarticulation in an unsymptomatic dog can very subtle, they can be very difficult to interpret. Preventative breeding can be frustrating as most dogs do not show symptoms until they are past their prime breeding age. The best we can do at this point in time is to be aware of Wobbler’s in our pedigrees, and breed responsibly." THIS IS A 183 page research paper on wobblers. As I am glad to have found this today, it also brings alot of heartache. I am sure some of you remember I lost my Jasmine this past Christmas of "wobblers". I read in a breeders thread today too that someone believes there is a test for CVI. I was told by breeders and the surgery dpt that did Jasmine's surg there is NO testing for this disease. I want to just say how horrible this disease is. I often sat and thought to times in her life if a fall, a trip, or her collar was to blame. OR just me if I did anything to hurt my girl unknowingly. The surgery was sucessful, but I really believe the meds caused her to fail in the end. The vets in MO said, however, I would have at best 2 yrs with her. I got a little over a yr. I am in the medical field and so I was curious about her MRI images and asked to see them. I could see clearly, the nicks in her spinal cord, there were 2 close together. One they thought might have been due to the fall she took, the other was prob the original issue. I know my dog never had the flexibility in her body even as a puppy. As she grew I could see she appeard weak in the rear and her back legs were "cow haucked" a bit with a weird gate. I am curious to anyone if they noticed stuff like this with their dog? I want to also say how sorry I am for anyone who is suffering with this. I prayed daily that somehow God would keep her going for a long time, that we would beat the odds. So I understand the heartache of watching a healthy dog go down due to neck issues. It is so sad. Jasmine was very healthy and ate well just darn CVI but in the end she died to complications of medicine. Anyway when I have time, I want to read all that you have links too in here. I am so afraid I'm gonna be an ol' mother hen when I get my next puppy. Thanks for reading and posting your info on this disease. I really appreciate it. As a 1st time doberman owner, it was sure a sad sad experience. Thank you for this post. It is very comforting to me that you should write this now. I share your heartache as I had to let my Luna go last week and I am completely crushed. I understand everything you are feeling; I understand your confusion and pain … you are still trying to make sense of this very complicated and heartbreaking issue. That is why Darkev and I started this thread. The option to treat medically vs. surgically is very personal and depends on the individual case. I'm sure you did everything you could for her and made the best decision for Jasmine going forward with surgery. I know my girl would not have tolerated it well, so I went the other route. Still, I question myself and that decision too. The prednisone kept her mobile for another 6 months, but it also added a whole host of side effects - weight gain, muscle atrophy, stomach problems, hair loss, excessive urination, eating and drinking... turned my young, beautiful, vibrant girl old so quickly. I was keeping her mobile artificially and maybe selfishly, I don't know. Like you, I thought I could keep her going for a long time and "beat the odds". What I have come to realize is that I couldn't stop it… it was not her fault nor was it mine. My vet said it best, " it is just bad luck and god." While we both did our best for our individual dogs, it simply was out of our hands in the end. All I know is we love these dogs so darn much and will do anything to keep them as long as we can. That can’t be wrong. I’ll picture Jasmine and Luna now, young and healthy again, running their Doberman hearts out over the rainbow bridge. I haven't been on DT since we lost our girl 6 months ago. I realize this last post was a bit emotional, and did not offer much hope to anyone looking for answers on how to cope with wobblers. That was not my intention in starting this thread and was not where I wanted it to end. Please know THERE IS ALWAYS HOPE. Every case is different, every dog is different and every doberman loving owner is different in what they can do to help keep their wobbler pup mobile. There are many success stories here and many wonderful resources to draw from. Do what you can... find a good vet, read everything, love them and make them comfortable. Make the best decision for you and your pup, the choices are many... medical, surgical, alternative or humanely end their suffering when it becomes too much. Above all, take care of yourself in the process. Hugs to you and yours. Hugz to Roxy and eighmie.